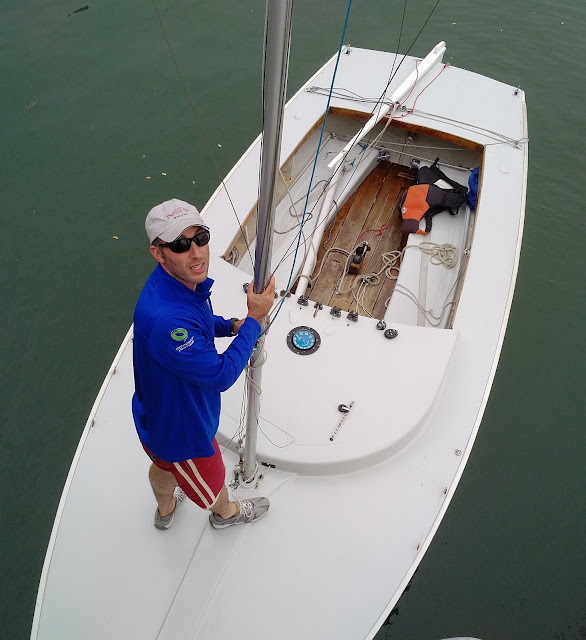 It was a gloomy day, cooler than predicted, with a strong tide and NO WIND! The only way we made any forward motion was when we were carried by the tide. Always had a keen eye on the red nuns!Not a very fulfilling day but fun, nonetheless. 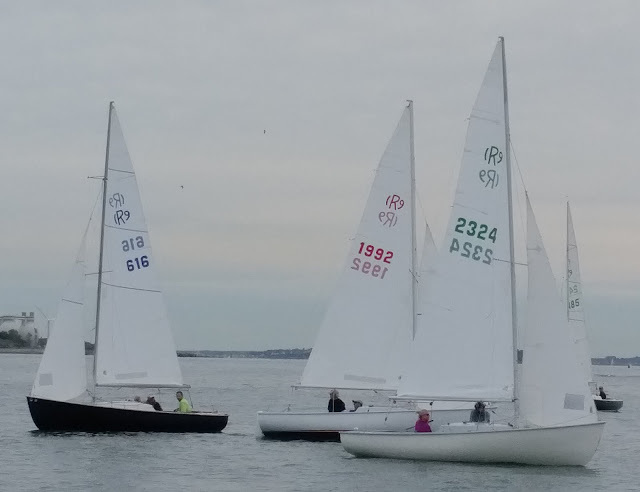 All 7 Rhodes19 sailboats from CPYC were ready for the races. 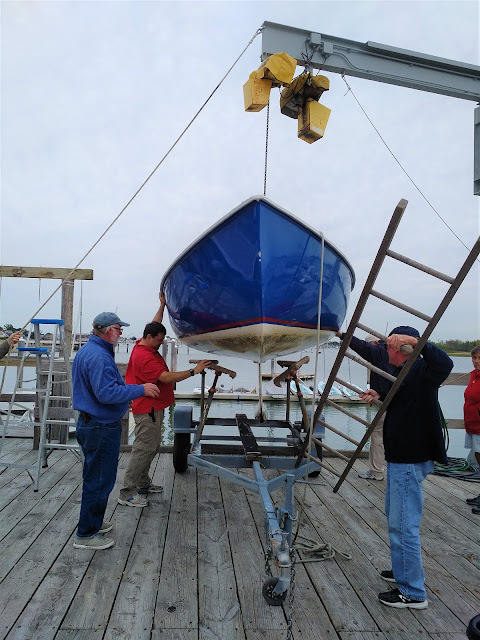 A closing ceremony was held with the presentation of a gold cup, then most of the boats were pulled from the water for winter storage. 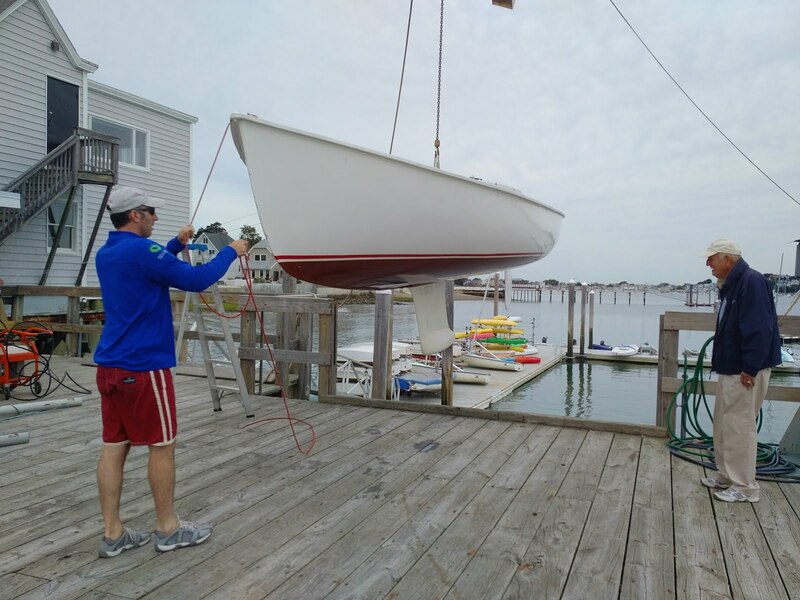 I took the main and jib sail off Mimi, and later this week we will haul her to the marina for her winter storage. Will need to do a little work on her and already am making plans for next year's races! Summer here is far too short. I always feel that I am just getting into a routine when the temperature becomes cold, the days shorter and time to do fall cleanup and prepare for winter. O, the chores! I am missing living in a warm climate yearlong. But I do enjoy the seasons, at least parts of them. But I am never ready for the cold, damp days of Fall. Crisp blue skies and sweater weather is rather pleasant when we have such days. And I am not even going to think about snow just yet! 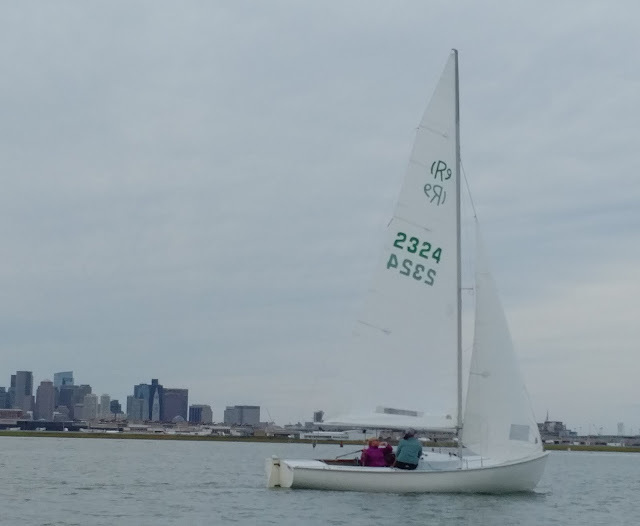 Here are a few pictures of our day of racing in Boston Harbor, gray skies and all! A rare moment of enough wind to fill the sails! 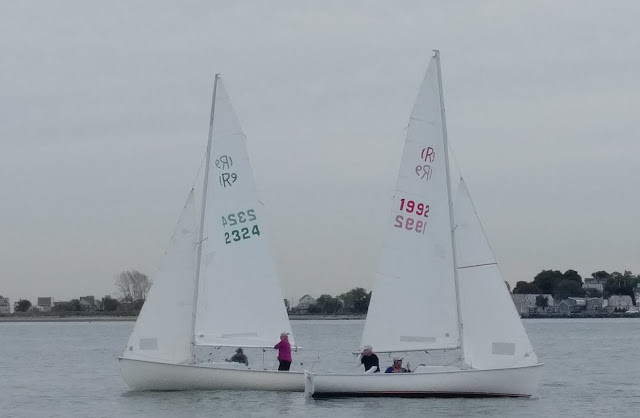 The fleet of Rhodes 19 with the spinnakers. 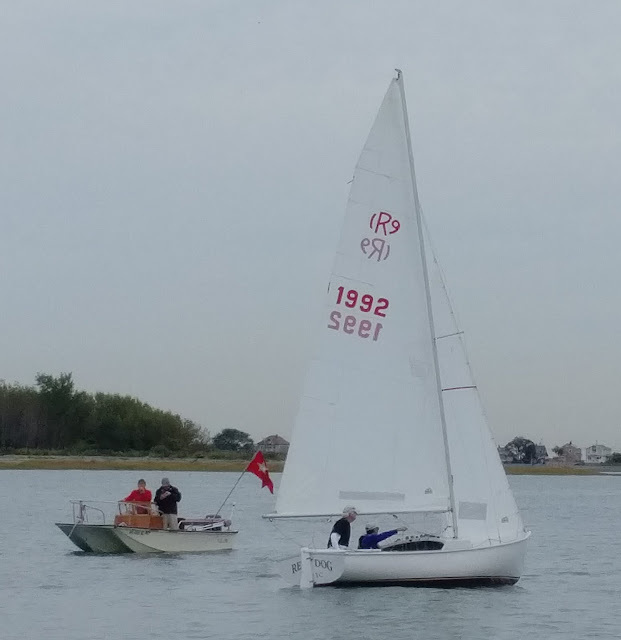 Race was complete with a committee boat to make it official. Mike Gahan and Dan. 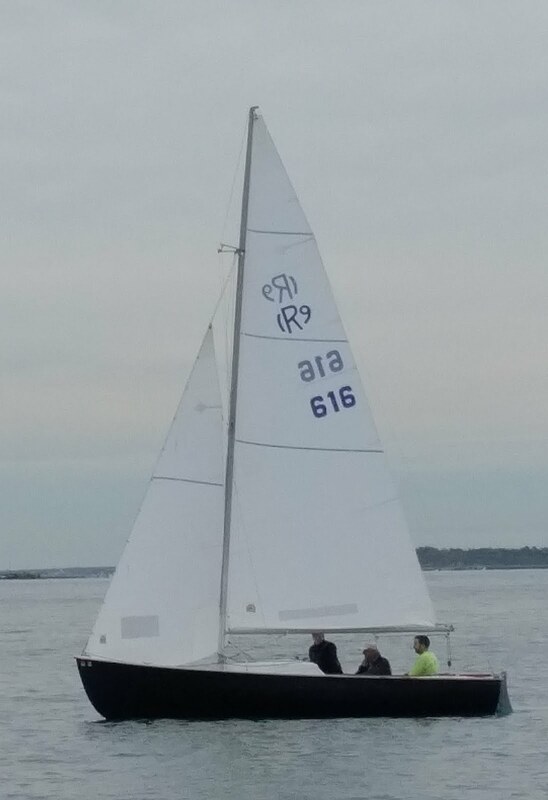 Winner of the races. Pulling the boats out of the water using the crane. What is missing with this maneuver? The trailer is not yet here! Preparing the masts for storage on the roof of the club. 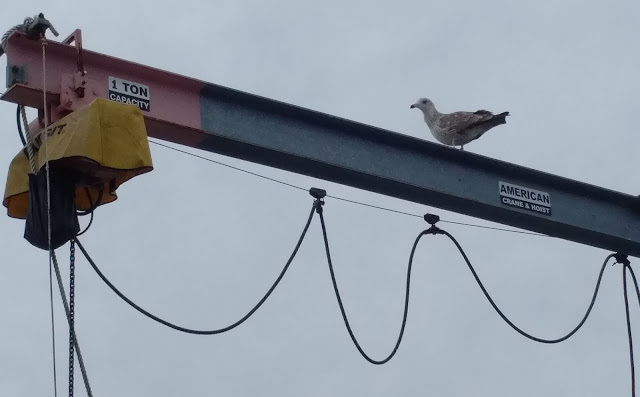 The seagull was the supervisor. 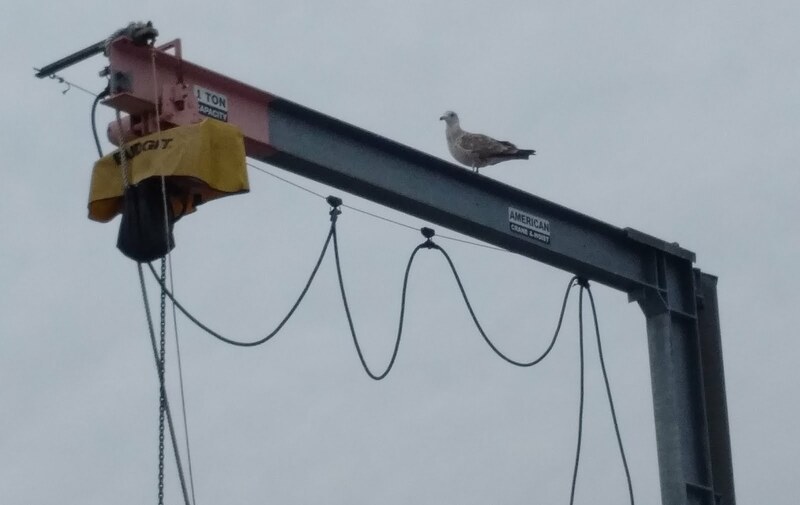 flying from one crane to another to watch the dock activities! O summer, we will miss ye! It was an absolutely beautiful summer day. It was warm, the skies were blue and there was a 15 knot wind. A perfect day to be on the water. But my little girl Mimi had a tough time going against wind and tide along hurricane alley. We had to tack often, made even more challenging by the many motor boats coming and going, creating wakes for her to maneuver. I am always hoping that the skippers of the motor boats are responsible and mind the rules of the sea. Most of them are. But some create huge wakes as they barrel past us, thinking it is fun to watch the sailboats struggle in the large wakes. But we made it out after much effort and had to turn around as the afternoon was getting late, and well, the New England Patriots game was going to start! The trip down wind was exhilarating and we just flew back to the mooring. However, one needs to gibe and pick up the mooring against tide and wind. So after many, many tacks, we finally made it back to the mooring. The force of the tide and wind kept taking us away from the mooring. 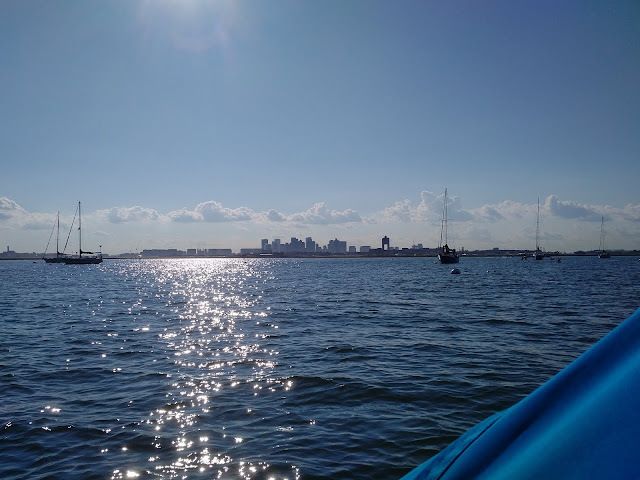 I had taken an indirect route as another sailboat was attempting to pick up her mooring close to mine and I did not want to be in her way if she missed it. 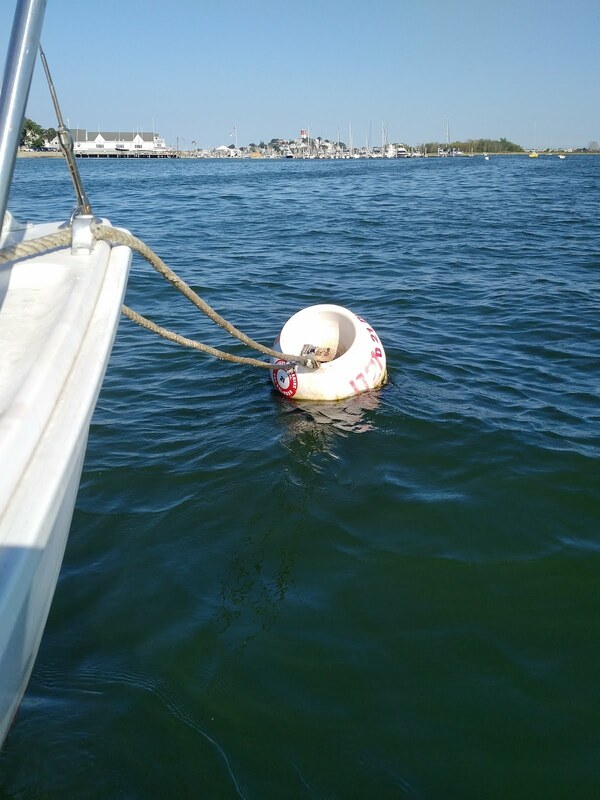 Finally - able to pick up the buoy with out problem. 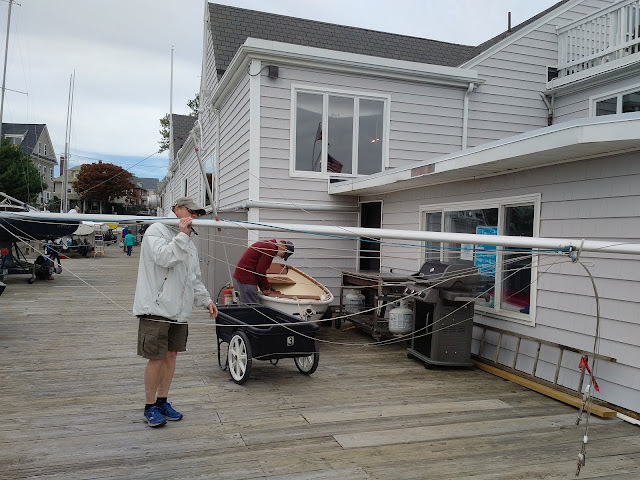 Watched one other small sailboat pick up his mooring and he had some challenges just like me. Persistence works, along with a calm approach. The small sailboat with a motor had the advantage, but I like sailing without being dependent on a motor. 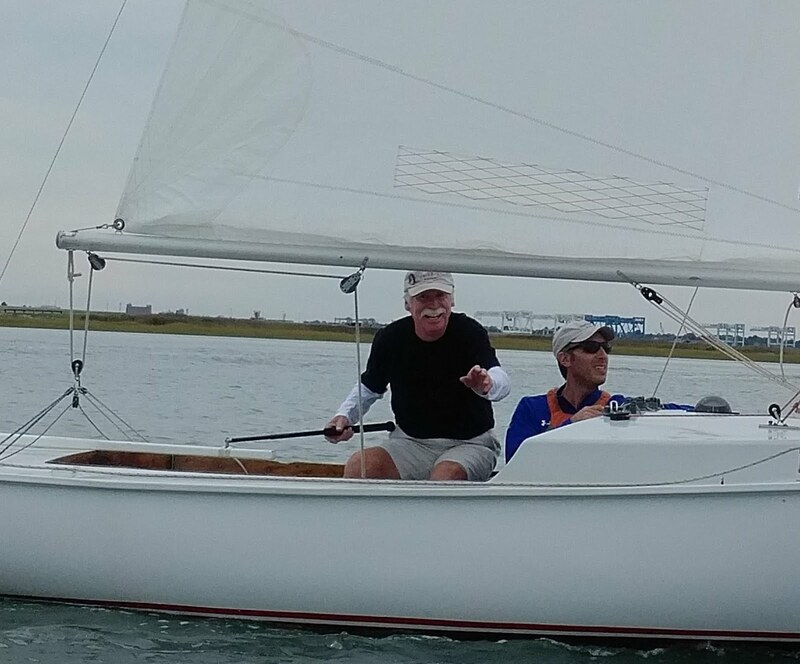 Am always working on developing my basic sailing skills. And of course, it seems like summer just started and it is already football season and almost time to have her dry docked for the winter. 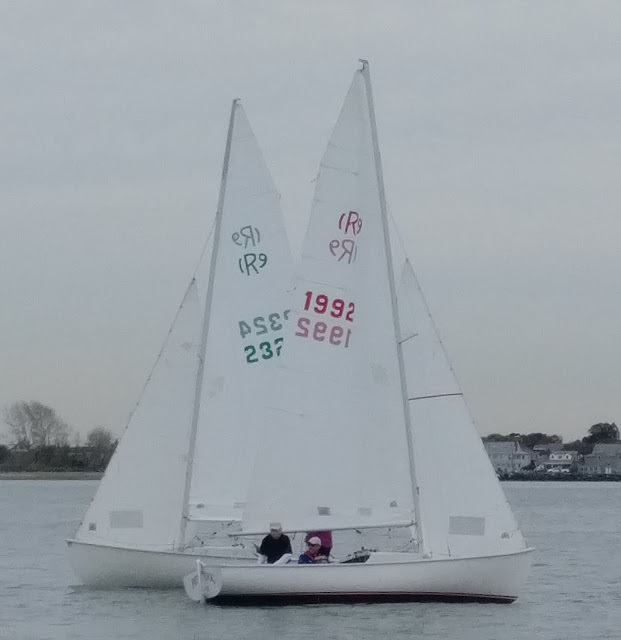 I need a longer sailing season! 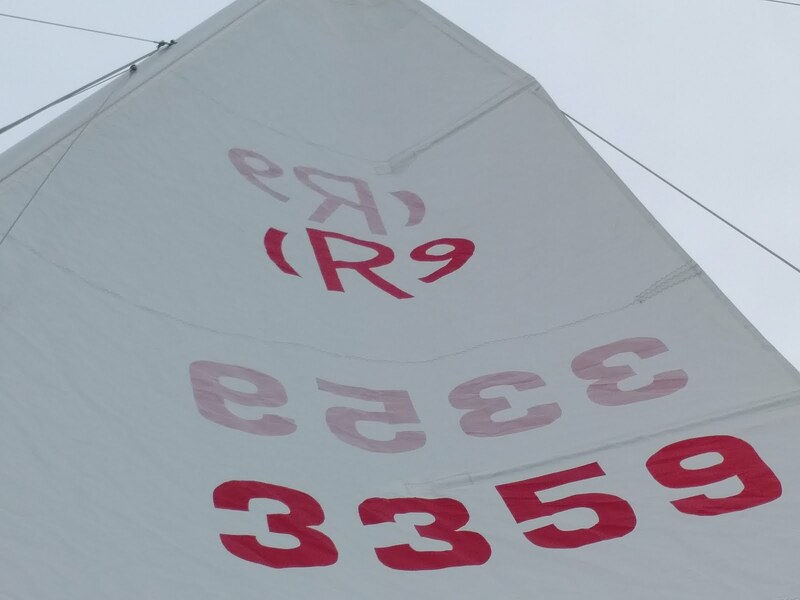 Next Sunday is our last Rhodes 19 race, an event not to be missed. A satisfactory feeling of getting back to the mooring under the power of the sail. Mimi is secure on her mooring as we prepare for Florence (hurricane that hit the Carolinas this week) to hit us with her rains and winds later this week. 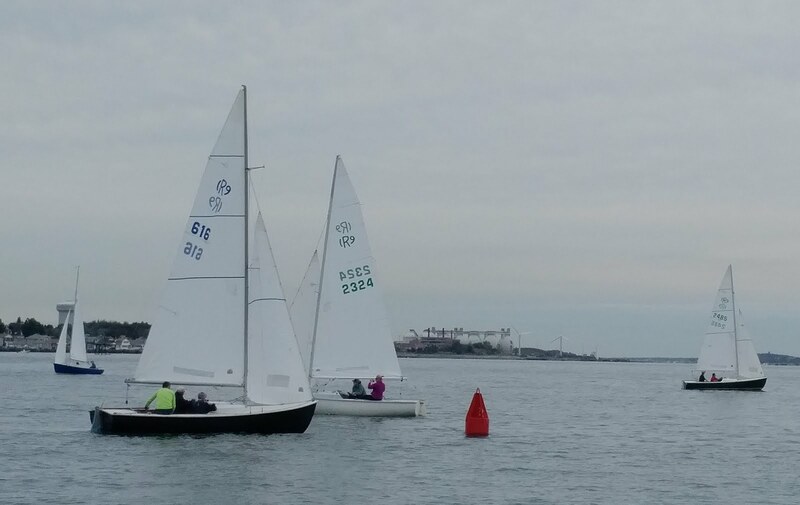 In the background is CPYC. Tide is rushing into the harbor. Ready for the storms with her cover securely in place. Boston skyline and airport in the background. 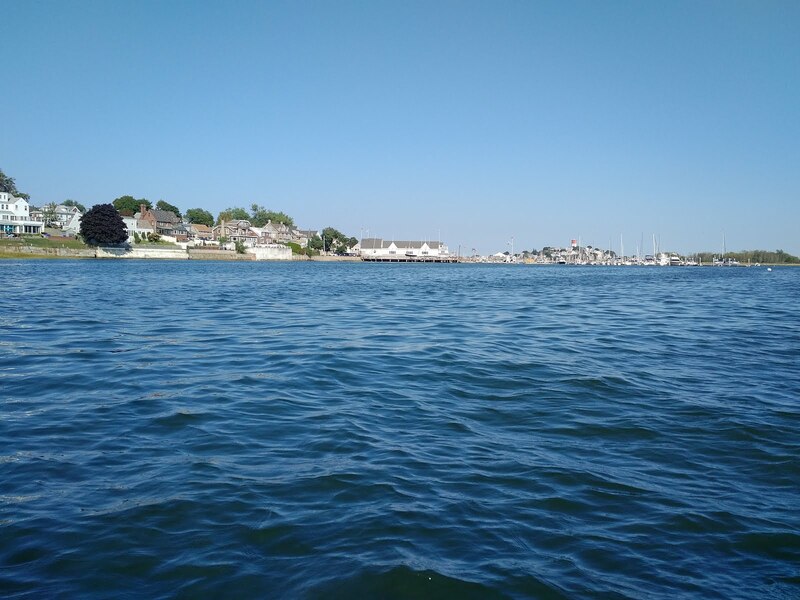 Saturday was the first I had free in a while, so I planned on a day trip to visit Kennebunkport, Maine. I have the opportunity to visit almost every year and enjoy the walks along the beaches, the town and Rachel Carson National Wildlife Refuge. I remember when I first brought Fionnegan home - he was born in Maine - that I took him to Kennebunkport so he could see the sea. Not sure he was aware of the majestic views, but he gave me puppy kisses any way! While the forecast was for sunny skies, it was quite gloomy. But is was warm enough - sweater weather - and comfortable. Only a very brief drizzle that was not enough to dampen any spirits. I did stop at the local town beach. Big changes - pay for parking, restrictions on parking for visitors, and many more dogs than I ever remembered. And a lot more people, too. Maybe there were so many people visiting as the weather is still pleasant in September. Yes, gray skies and low tide in the morning. And large, beautiful houses along the shore. There are many photographic opportunities. Here is one of the lovely roses along the beach, complete with a pollinating bee. This Maltese had the best of all worlds. Bella walked for a while, then when she was tired, was placed in a cart where she could watch from the comfort of her front seat! And this pup is her big brother. A tall ship leaves the port for a brief excursion. There is a beautiful stone church, St. Ann's, on the coast. This is the first time that I was able to enter the church. It had been under construction for a long time and is closed during the winter season. There was to be a wedding there later in the day. Mrs Bush was the mother of our 41st president and grandmother of our 43rd president. Do you think little Josie is trying to figure out how to ride the bicycle? Maybe she just is having fun relaxing. This dog is often found at the church. This is the summer home of President Bush and his wife Barbara, who died this year. My journey took me to Gooseneck beach. It is becoming a favorite of mine - scenic, fewer people and more parking! There were people in swim suits, although I did not find it that warm. I think most little kids are just happy playing and exploring. There were a few seagulls. This one is a Herring gull. This is a ring-billed gull. If you look close, you will see something in his bill. And much to my pleasant surprise, dunlins! Missed the horses, must be a great experience riding horses along the sea. 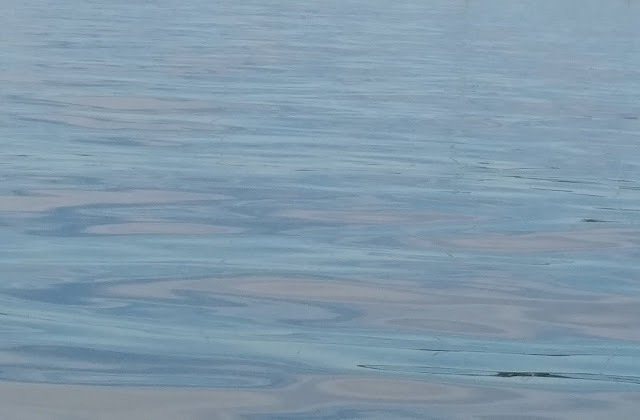 Here is one energetic soul paddle boarding in the sea. No wet suit. It has to be cold. Breakfast, lunch and dinner for the gulls. Asters along the beach pathway. After a lovey walk along the beach, I headed back to my favorite beach at Parson's Cove. The crowds are limited by the number of places to park. I have been going there for over 30 years and love each and every moment. Even when I looked myself out of the car! Yes, I have done that many times in many remote areas. A large dog enjoying the day. Looks like he had a swim, too. Surfers. 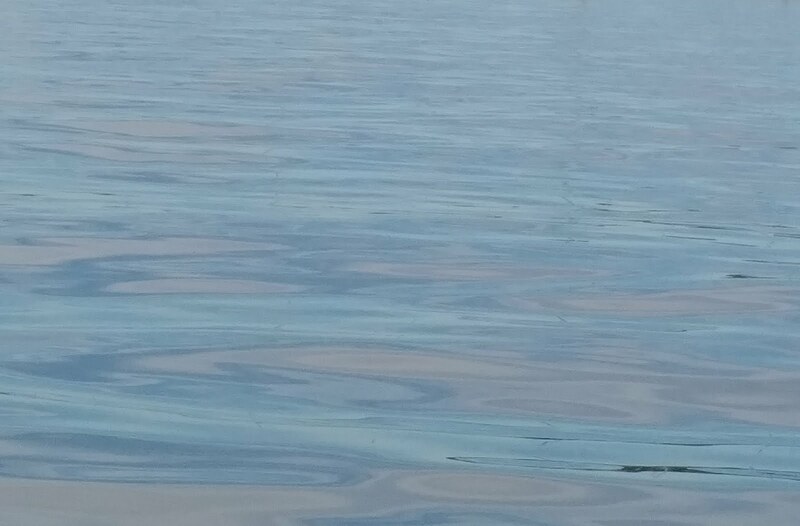 In my younger day, I would swim in these cold waters. I would get chilled to the bone, but it was something I had to do. The sea. Beautiful in any weather. This was a great way to spend the day. Cloudy or not, there was a lot to hold my interest. The birds, as always, were fascinating to watch. They too seemed to take a break and watch the people and the ocean. Since I had walked for a several hours on a few beaches, I decided it was agreeable to stop at the Maine Diner for a piece of homemade blueberry pie. Only about one or two miles inland, the skies were blue! So I enjoyed the pie and the lovely sunflowers in the garden, Then headed back home to my boys.